Where can I find a quick overview on how to use this forum? Five video tutorials are available in the SuSanA Youtube channel to explain how to use this forum. Please access them here. Why and when was this forum started? The idea for this open discussion forum on sanitation came from our experience that when you want to buy a new car or have a question about your child’s physical development: where do you get advice from? You put your question into a search engine like Google and you end up reading other people’s postings on a discussion forum. Usually, those questions and answers prove to be very helpful. The same can hold true for a discussion forum on sanitation issues. This is why the Sustainable Sanitation Alliance (SuSanA) secretariat launched this discussion forum on 8 July 2011. The general goal of the discussion forum is to make knowledge, ideas, debates around sustainable sanitation more accessible to everyone - inside and outside of the SuSanA network. Another goal of the SuSanA discussion forum is to accelerate learning within the sanitation sector. The discussion forum enables convenient and efficient exchanges of information, experiences and practical problem solving ideas. The information can also be found by any internet user. The community moderators are recreating on the forum the ‘SuSanA spirit’ of openness, respect and passion for the cause. What are the main characteristics of this forum? The forum is completely open as opposed to some existing closed fora which require a login for reading other people's posts. Our forum only requires a login for writing posts. All posts are searchable by search engines like Google and Yahoo. A broad range of topics are covered such as sanitation systems, hygiene, health, WASH in schools, behaviour change, CLTS, science and technology, agricultural reuse, upscaling, sanitation governance, global political processes and many more. All registered users can contribute to the forum by creating new discussion topics or by responding to the posts of others. The users can also attach documents and photos to their posts. 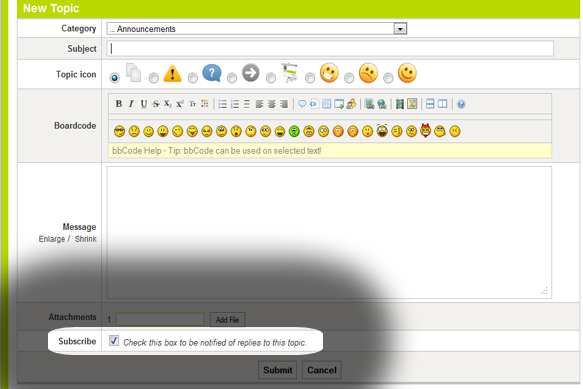 In addition, you can subscribe to specific categories or topics after logging in and thereby follow specific discussions. When people register to become a SuSanA member they are automatically also registered for the SuSanA Discussion Forum and vice versa. This means that all registered forum users are also SuSanA members. The rules for using the forum are spelled out here. The emphasis of this forum is on individuals coming together, independent of their countries of origin the organisations that they work for. Everyone is welcome who has a personal interest. A Do-it-Yourself person or “tinkerer” and a senior executive from a major international organisation are both welcome as equals. What each has to say is potentially of equal importance, and moreover each can learn from the other. Members exchange experience and expertise on sustainable sanitation priorities, activities and trends. This forum is moderated after posts are made by users: To ensure integrity, the forum is overseen by skilled moderators. The moderators may move posts to other categories or threads where they fit better, to break long threads into two, to rename a thread title, to temporarily or permanently delete posts and to ban abusive users. This forum is centred on topics related to sustainable sanitation, the Sustainable Sanitation Alliance (SuSanA) and people/organisations who are active in the sanitation, water or hygiene sector. It is not a place to promote ideological, religious, or political matters. We do not allow plain commercial advertising. On the other hand, we do encourage private sector participation and therefore are open to posts by people working for companies selling sanitation related products and services. Who is financing the administration of this discussion forum? The discussion forum is administered by the SuSanA secretariat at the Deutsche Gesellschaft für Internationale Zusammenarbeit (GIZ) GmbH in Eschborn, Germany who receive funds by the German Federal Ministry for Economic Cooperation and Development (BMZ) to operate the SuSanA secretariat since early 2007. Also since the end of 2012 and until end of 2015, co-funding for the discussion forum is being provided by the Bill and Melinda Gates Foundation. Is there a presentation available which explains more about the forum and about SuSanA? Yes, there is. Please see here our standard set of slides to explain the forum and SuSanA in general. The forum is explained in Chapter 9 of that presentation. To view the discussion forum or to obtain your own login for writing on the forum, please click here. Option 1: We have programmed our own SuSanA forum digest service. In order to satisfy your requirements you can choose how often you would like to receive the digest in your e-mail inbox. The options range from "daily" to"monthly" (if you don't like to receive the digest you can also choose "never"). If you are already a SuSanA member you are currently receiving the digest service twice a week. You can change the frequency here. If you are not yet a member you can register here and set the frequency in the registration process. Option 2: Anyone who does not want to have a SuSanA login can subscribe to a notification service by "Feedburner" here. Please enter your e-mail address below and you will be notified by e-mail of new posts from the last 24 hours. You can unsubscribe at any time. 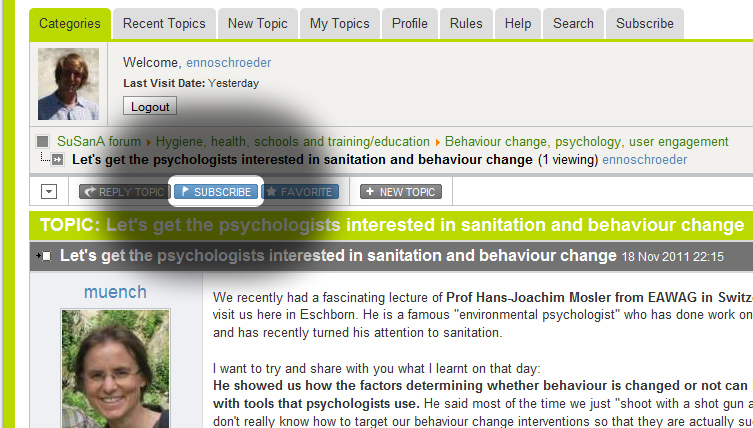 If you like to receive e-mail notifications for a subcategory or topic (thread) that you find interesting you can click on "subscribe" (you need to be logged in to see the button). If you write a posting yourself you will find a subscribe box which is ticked by default, so that you will automatically receive the replies to your topic. You can of course untick the box if you do not want to be informed via e-mail. If you have any questions about these subscription options, please ask them here on the forum.